When creating or editing a bot, you may add a code snippet by clicking the "+" to add an action as you normally would. From the action selection panel, click on "Run a code snippet". Next, give your action a nickname. 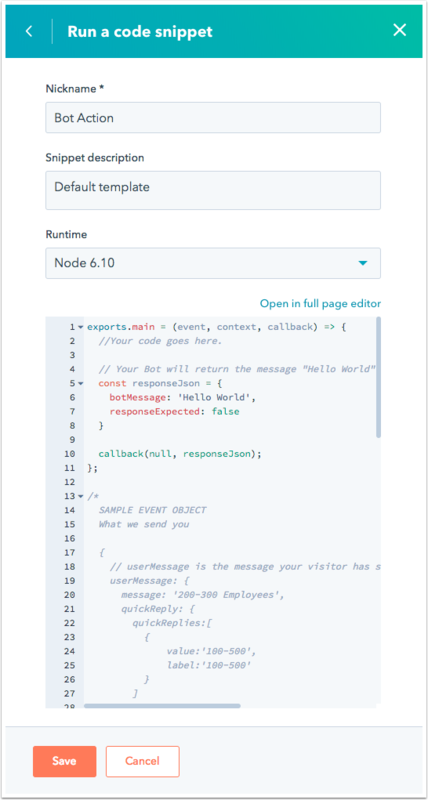 Within the code editing pane, you will see our default template for Node.js 6.10. The details of the "event" object and possible response object formats are detailed below. Once you've saved your action, the code will be triggered once the applicable part of the conversation has been reached. The exports.main() function is called when the code snippet action is executed. The event argument is an object contains details for the visitor and chat session. The callback() function is used to pass data back to the bot and user and should be called in the exports.main function. // If the visitor selected any quick reply options, this will be a list of the selected options. // Will be 'null' if no options were selected. // The contact VID of the visitor, if known. // A list of properties collected by the bot in the current session. // This is the message your bot will display to the visitor. // If true, the bot will display the returned botMessage, wait for a response, then execute this code snippet again with that new response. Several popular Node.js libraries are available for use within the code snippet. The libraries can be loaded using the require() function at the top of your code as normal.